BioBag® is the world’s best selling brand of 100% certified compostable bags and films made from the bioplastic material, Mater-Bi. BioBag® products are made from starch, plant-based polymers and other renewable resources. No polyethylene is used in the production process. BioBag® was the first “bag from corn” to achieve national distribution of retail products through natural food stores across the country. BioBag® uses only sustainable crops for their bags, and prints them with soy-based inks and dyes that are DEN certified for restricted use of heavy metals. 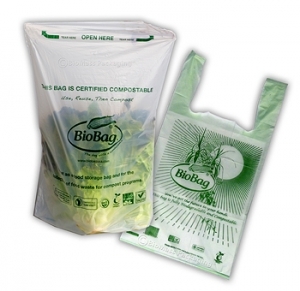 BioBag® products meet ASTM D6400 compostability specifications as well as stringent California Law requirements, and are also DEBIO certified for use in organic agriculture. …that the city of San Francisco selected BioBag® to promote their residential food waste collection program? They sent 100,000 rolls of BioBags to residents within the county to help educate consumers about the importance of diverting food and other compostable waste from entering landfills. BioBag® is proud to be a partner in this important effort.